On the left: an archaic form of English. On the right: an archaic form of Greek. Fam, this school is old. The Multiply book accompanying the Triad study emphasizes rest. Paul’s main point here may not be to present praise as a normative response to grace, but in Multiply, Pastor Stephen Kirk presents rest as a normative response to God’s guarantee in the Holy Spirit. The book includes an extended breathing exercise, encouraging the reader: “Breathe in and breathe out the truth of God’s grace” (Multiply 51). Kirk punctuates each cycle of inhalation and exhalation with a reassurance of God’s grace, emphasizing that his blessings in Christ depend not on our goodness, but God’s. To be honest, rest isn’t the first thing I’d go for in describing the focus of this chapter. Paul’s tone strikes me as more ecstatic than anything, and while Kirk draws heavily on Paul’s description of the Spirit as “a deposit guaranteeing our inheritance” (Ephesians 1:14, NASB), Paul points to the outcome of that guarantee as praise. Peace and rest are so secondary to his immediate point that the words don’t even show up in this passage. But it would be ridiculous of me to insist that we can look at no other scriptures all week long, and there are plenty of other scriptures that reject the restlessness of works-driven salvation. Paul uses the word “peace” eight times in his letter to the Ephesians, even urging his readers to pursue “the unity of the Spirit in the bond of peace” (Ephesians 4:3). His other writings have plenty to say about the futility of attempting to earn salvation by your own deeds, and if you consider Paul to be the author of the epistle to the Hebrews, then you believe he wrote this: “For the one who has entered His rest has himself also rested from his works, as God did from His” (Hebrews 4:10). 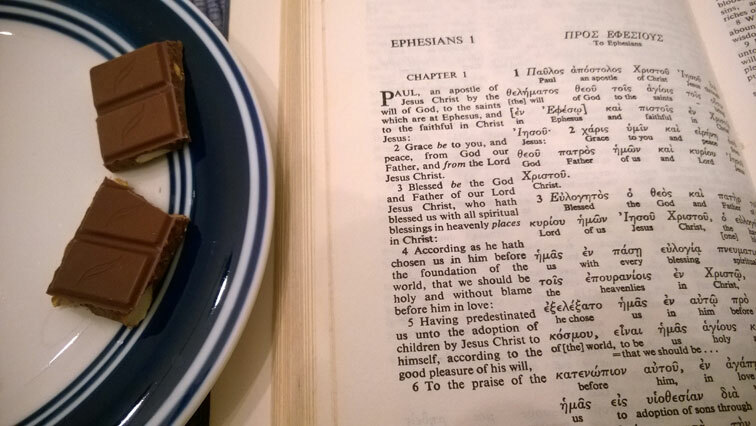 And in fact, Paul’s corpus reflects a theme of resting in God’s grace throughout the entire Bible. As we saw during our study of the Sabbath, sometimes rest is even mandatory! Okay, look, that last one may convolute things a bit. But if rest is ever mandatory, today is a day I am not complaining. We can bring in other scriptures when we talk about the passage of the week during the Triad study! We can relate stuff to other stuff! We can chill out and not make a big issue of things! And that is exactly what we’re going to do. Posted in Daily Reading, Ephesians, Hebrews, Hope Church Triad Program, New Testament, Topical Studies.Tagged bible, christianity, devotional, Ephesians, God, grace, Holy Spirit, paul, peace, Sabbath, Walter Brueggemann. In context Moses says this about Benjamin, a tribe of Israel, descended from Jacob’s (Israel’s) youngest son. But in other places in Scripture, God offers us the secure position pictured here when we receive Christ into our lives. We are beloved, secure, shielded, and we live resting between the LORD’s shoulders. I liked the way you viewed this Ephesians passage as carrying the message about God’s “boat load of gifts”. It’s good to be able to bring other passages to bear on the passage at hand. Thanks for sharing the bit about Benjamin’s blessings from Deuteronomy!